Nearly all of the most successful bloggers use Google Adsense in order to maximize their revenue, beside this some use Affiliate Marketing but I will discuss affiliate marketing later on my blog posts and I will surely tell you how you can earn handsome money from Affiliate marketing but for now I am going to tell you about high paying niches for Google Adsense Earning. Before coming to my main topic I want to tell you some key points which you should have to follow in blogging career. WordPress is specially designed for blogging. You have a full control on your blog site. If you are getting a high volume of traffic but you are not earning from AdSense then the main reason might your ad placement. Optimizing your site for Ad placement is very important. There are many Adsense plugins for WordPress which makes your life really easy. But I will highly recommend you guys to use some best google AdSense optimized WordPress themes. Why I am more focus on theme because the more you use plugins the more your site is getting slower and we know that we won’t compromise on site speed, so why not using a theme which already have this option Ads placement. Many of you know what Niche is, but for those who are new to blogging “Niche is the topic on which you are going to blog”, so therefore before starting your blogging journey you need to select some those niches which are high paying in Google Adsense and related to your field. So without wasting any future of your precious time, here is the list of Most Profitable High Paying Niche in Google Adsense. There are many insurance companies who offer health insurance, car insurance, and many others. They competition among insurance companies is quite huge and that is the reason that insurance is one of the most expensive niches. If you are blogging niche is insurance then you are earning a huge monthly income. The highest CPC (Cost Per Click) on keyword insurance is $54.91 which is quite awesome. But keep it in mind that this niche has the most competition and it’s tough to get rank in this niche as insurance companies are investing a lot for this keyword. So if you are new a blogger then try to avoid this niche. The mortgage is a legal agreement in which a person borrows money to buy property (such as a house) and pays back the money over a period of years. There are many people who lend houses on mortgage and they want to know how to pay less interest and how they can pay mortgage early. To help out people there are many mortgage brokers who find the best available mortgage product for them which matches their needs. Now obviously those brokers charge fees for that. Now you can blog on a mortgage like giving people advice on how they can save money to pay their mortgage early. The mortgage is the second highest CPC keyword in Google AdSense and you can earn up to $47.12 CPC which is handsome money. The one of the highest paying and profitable niche for Google AdSense is health and its various aspects. People wants to live fit and healthy life and because the cost of medical care is incredibly high, people with no serious health concern use the internet to search for advice and dealing with minor health issues. They search for home remedies, reviews for vitamins or supplements and other’s personal experiences. This is the reason that Google AdSense pays high for this niche. But always remember you should have a proper knowledge to give any tips regarding health because any wrong medical advice could lend you in legal trouble. We are living in an era of technology and due to rapidly expanding the reach of technology day by day with promising features and applications, many people search the internet for guidance and its use. Moreover, peoples who were already loaded with the latest technology trends always try to upgrade themselves with latest technological trends and upcoming devices in the market. These days technology is the hot cake way to bring traffic to your blog and increase ad revenues. So technology is the niche which is not only a profitable in terms of high paying rates but also offers a wide range of organic traffic to your blog. One of the major reason people read your blog is to simply learn how to blog. They want to learn the Pro Bloggers techniques. They want to learn how to get traffic to their blogs and much more. There are a lot of bloggers who are writing on just blogging. So, instead of just copying them, you have to take a step further. All you have to do is to offer your reader some unique content which other are not offering. Keep one thing in mind: Don’t copy others, just have your own style of blogging. Beside this produce content which will be beneficial for your reader. This will help you in getting traffic and readers trust and once you get readers trust then you are on the right way of success in blogging arena. Ummm, I just called it a Girls Niche. Just kidding. Every person wants to look cool and attractive and fashion is the niche which is changing its trends day to day. There are many blogs on makeups, clothing and latest designs. Even men’s fashion has become very popular these days. If your niche is Fashion and you got a good traffic then there are many companies who are willing to publish their ads on your site and believe me they pay significantly higher rates to get space on your blog page. There are many fan and followers of celebrities and they are really very excited to read gossip about their favorite celebrity. Just like health as a niche, you also have to be very conscious about selecting subject before blogging on celebrities. Try to avoid writing on those subjects which create hates and will lead you to any legal difficulty. Instead, if you get a chance then you can be an official promoter for celebrities or any other telemarking company. Even you write topics like “Which Perfume is most popular among celebrities”. Everyone wants to make money. And Making money is one of the most searchable niches. People search for making money from home via the internet. There are many bloggers who are earning a handsome amount each month and if you are among them then you can share your secrets of making money. And as this nice has high CPC rate, this mean you can improve your AdSense revenue by writing on this niche. SEO or Search Engine Optimization is a technique through which you can make your site more visible to search engines. There are numerous blogs and websites, and all of them wants to get the better position in search engines. So everybody wants to know the latest techniques to make their blog or website more SEO friendly so that they get the better search results. That’s is the reason SEO is one of the most searchable topic words wide and high paying niches in Google AdSense. 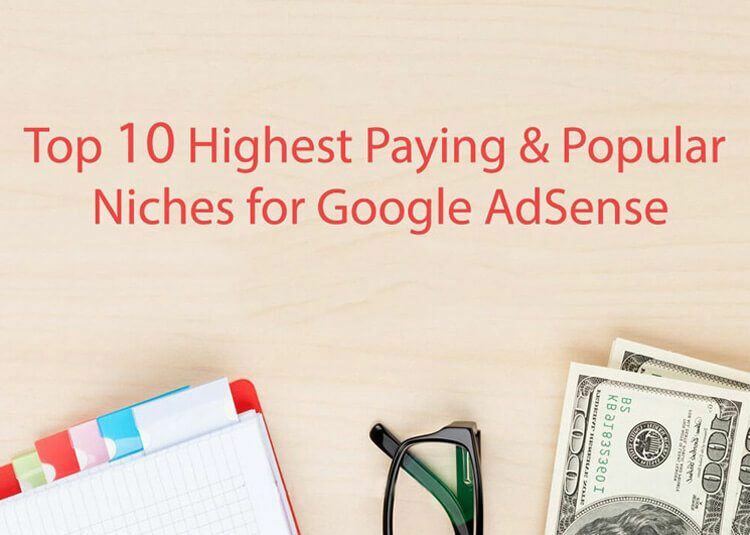 I hope you like the list of Highest Paying & Popular Niches for Google AdSense. Do tell us what is your niche for AdSense and why? Thanks Amit for your appreciation. Good to know that you like my article Imran.